The Good Food movement is on a roll, and rising consumer demand is prompting trade buyers — restaurateurs, wholesalers, retailers or others — to seek out more locally and sustainably produced food from small to medium-sized farms. 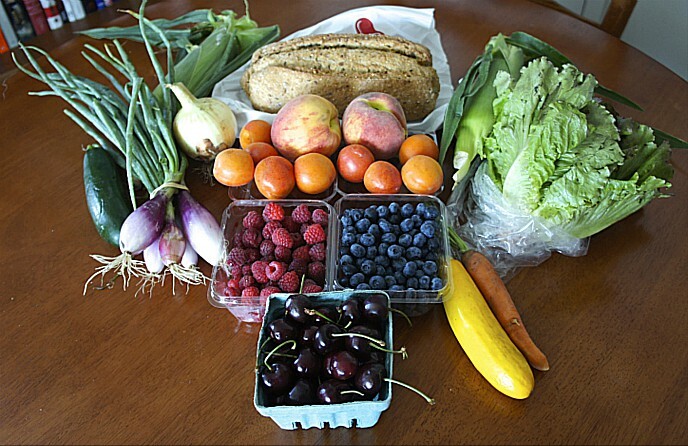 Yet even in the Internet age, it can still be challenging for Good Food buyers and sellers to find each other and do business. 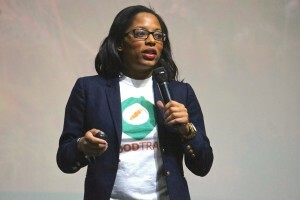 That is why FoodTrace, founded in 2014 by young Chicago entrepreneur Riana Lynn and and Andrew Hill, is drawing so much positive attention for its technology-based platform, designed to enable producers and food businesses to connect. The FoodTrace website (http://thefoodtrace.com/) provides interactive profiles of subscribing producers — mainly farmers and food artisans — that show the products they offer, their locations, the geographical range of their market, and other data, and of subscribing trade buyers, with products they are seeking along with other relevant information. The company’s motto is, “We are helping farmers and artisans sell more and buyers buy better,” and Lynn said she and her team are actively meeting with and adding companies to their software. “Disconnect between the two ends of the supply chain is a huge roadblock to scaling local food systems, and over the course of the last year, we’ve come to realize just how powerful our technology can be in getting past those barriers,” said Lynn. FoodTrace has helped Lynn emerge as a rising star on the growing food-tech scene. She was a member of the first cohort of entrepreneurs selected to participate in FamilyFarmed’s Good Food Business Accelerator. The program — based at 1871, a Chicago center for innovation and business incubation — provided a curriculum, mentorship, technical assistance, and networking opportunities to FoodTrace and eight other entrepreneurial businesses in a session that began in December and concluded in May. 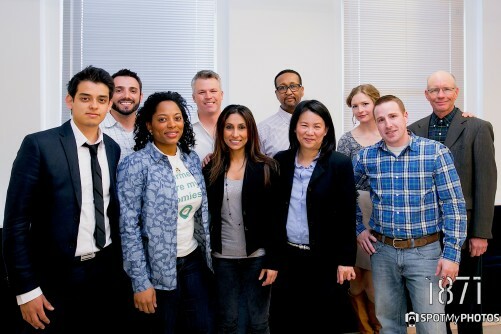 Riana Lynn of FoodTrade, second from left in the front row, with the other Fellows in the first cohort of FamilyFarmed’s Good Food Business Accelerator during Demo Day at 1871 on April 27. First row (left to right): Alberto Rincón of The Urban Canopy, Lynn, Rowida Assalimy of Kishr, Jenny Yang of Phoenix Tofu, and Mark Schneider of Living Water Farms. Back row: Nik Jakobs of Jakobs Bros. Farms, Shane Christensen of dailyServing, Thomas Frierson of Spark of the Heart, and Raya Carr and Harry Carr of Mint Creek Farm. Photo by Greg Rothstein, 1871/Spot My Photos. She is still at 1871, in Chicago’s historic Merchandise Mart, as one of three entrepreneurs competitively selected for the Entrepreneur in Residence program launched by the San Francisco-based nonprofit CODE2040, with backing from Google, that seeks to advance minority entrepreneurship in technology fields (Lynn is African American). Crain’s Chicago Business also recently named the 29-year-old Lynn as one of the publisher’s “20 in Their 20s” young influentials. 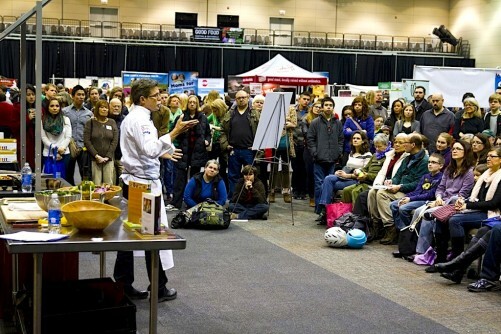 Good Food Business Accelerator Fellow Riana Lynn of FoodTrace pitches her business plan at the Family Farmed’s Good Food Festival & Conference in March 2015. FamilyFarmed is currently planning the 2015-16 session of the Accelerator, and information about applying for fellowships will be published soon on the program’s website and on Good Food on Every Table. This entry was posted in Farm businesses, Financing, Food and technology, Food Entrepreneurs, Good Food Business Accelerator, Good Food business development, Good Food marketing, Regional food systems, Sustainable food retailing, Sustainable food systems and tagged CODE2040, Crain's Chicago Business, FamilyFarmed, Food and technology, food tech, FoodTrace, Good Food Business Accelerator, Good Food business development, Good Food marketing, Google, Riana Lynn. Bookmark the permalink.